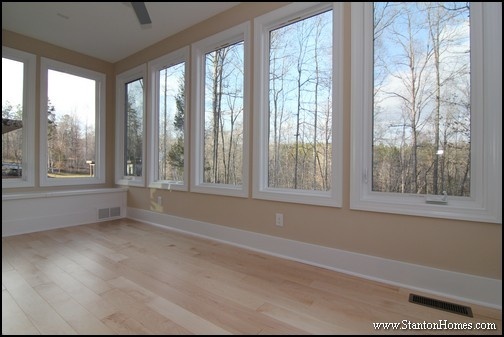 Relax in the natural light of a sunroom - designed to enhance your view. 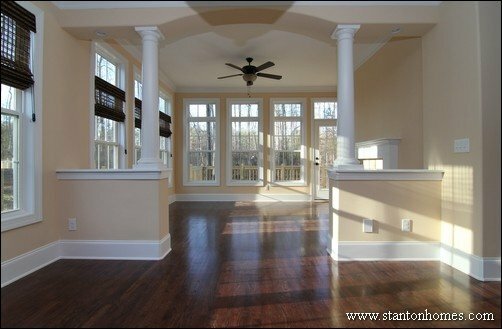 These Raleigh new home sunrooms come in all shapes and sizes, with window walls, and unique flooring ideas for your new home. 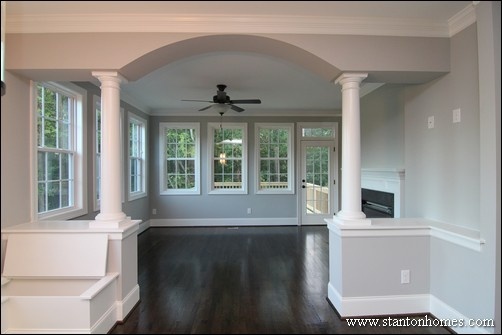 Contact Stanton Homes to learn what it costs to build a custom home in the Raleigh, North Carolina area. 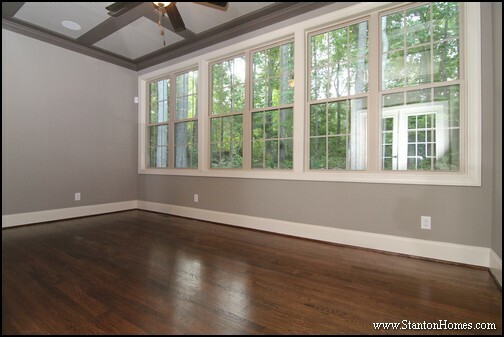 This is a year-round sun room is designed for soaking up the summer sun and staying warm on cold winter evenings. 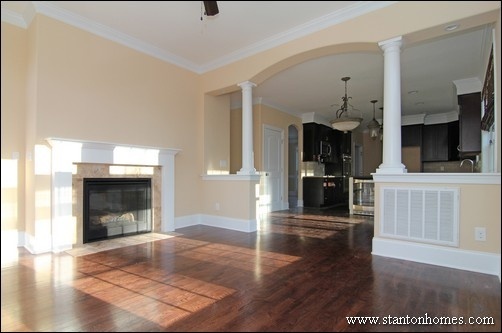 The two-sided fireplace leads between the sun room and great room. You can tuck hidden storage into your sun room, with a built-in bench below the windows. 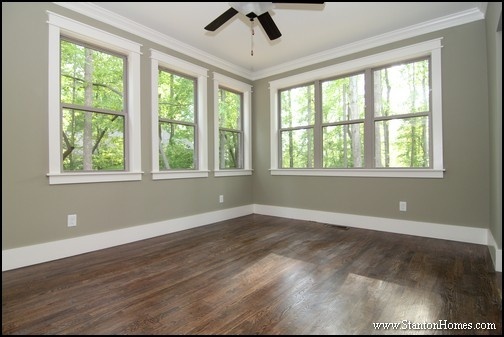 This sun room runs along the kitchen wall, for an out-of-the-way relaxation area that stays separate from the great room. See a photo gallery of the rest of this home, click here. 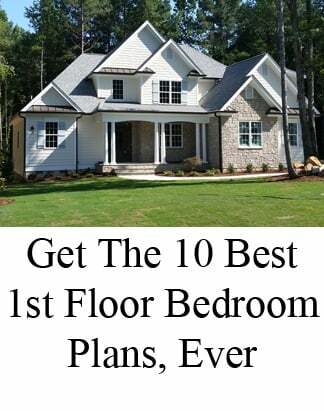 While less traditional in terms of home plan layout, we're seeing more home buyer requests for interior windows between the great room and sun room. 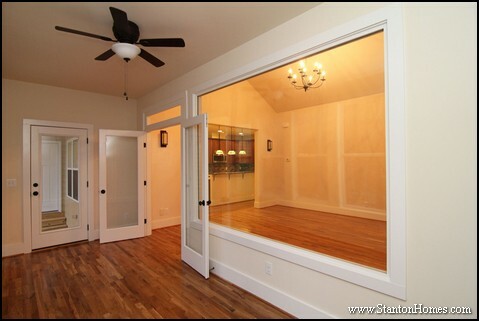 In this home, a version of the Whitehaven, a large picture window offers views between the two main "hang out" areas of the home. Plenty of windows - and French glass doors - are must-have for a sun room design, ceiling treatments can turn a casual relaxation area into a formal space for guests to gather. 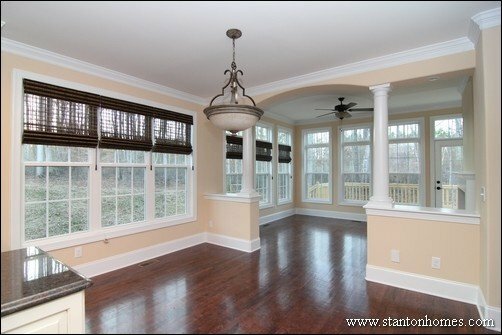 In this version of the Chapel Ridge, a two-tone coffered ceiling with indoor fan accents the sun room. 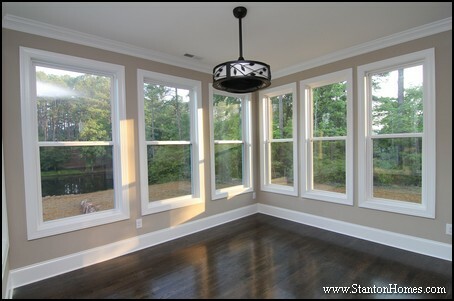 View from the breakfast room, looking into the open concept sun room. The kitchen bar area (with wine refrigerator and rack) fits a flat screen TV, placed especially for a sports-loving family who wants to watch the game from the island. 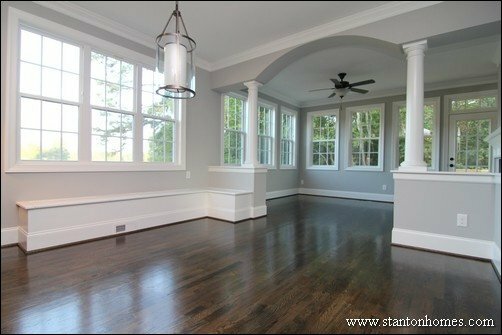 Rather than accenting the ceiling with a coffer or vault, this sun room focuses on craftman trim details - with hand-built frames around the windows. 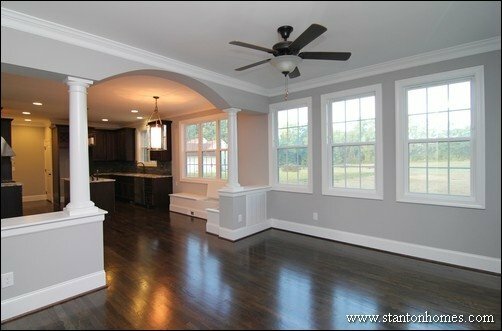 A square ceiling fan light gives a touch of contemporary design to the modern craftsman home - photographed in a version of the McAlvany. 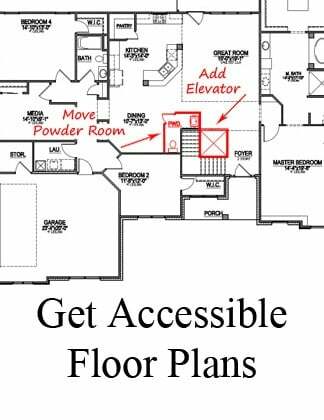 If you're looking to downsize your home, or for ways to maximize the efficiency of the spaces in a larger floor plan, a breakfast room / sun room combination can make great use of space. 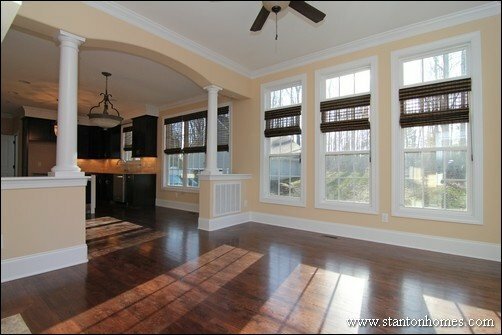 This breakfast room, located on the rear corner of the home plan, lets in tons of natural light. 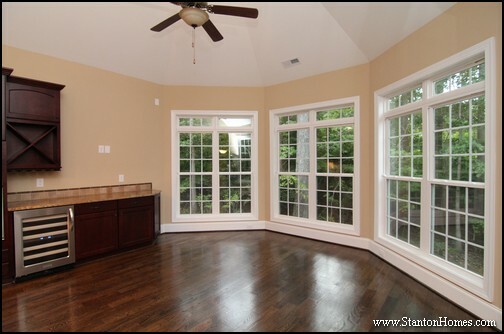 If you want to designate a formal dining space, consider converting a corner space such as this into an open concept sun room. 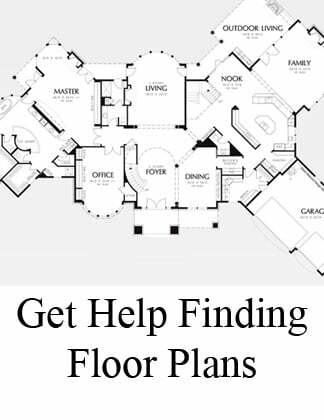 When you build a truly custom home, your builder can tell you how much flexibility your floor plan layout allows - and how to redesign to meet your needs. 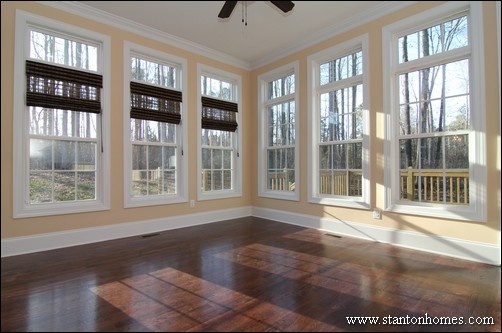 How will you use your sunroom? 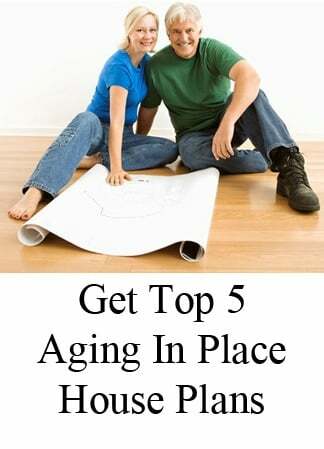 Before you know what specialty rooms to include in your Raleigh new home, take a family poll on how often you use the spaces you have now. 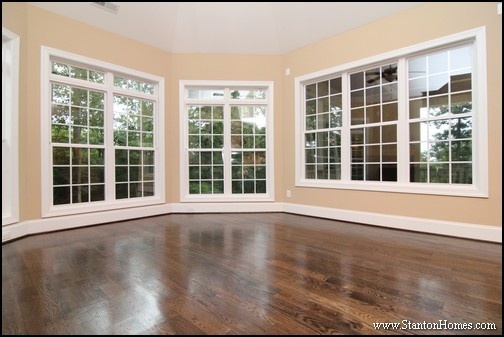 A sun room can give you the best of both worlds, when deciding between indoor and outdoor living space. 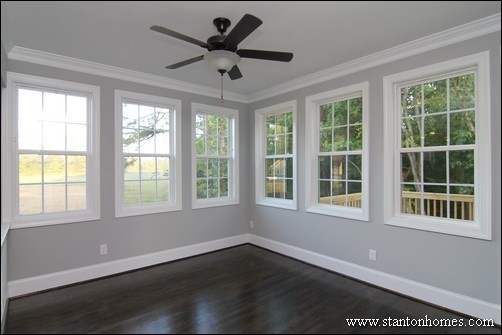 See over a dozen sun room photos in this Houzz Ideabook. If you're looking for more outdoor-oriented spaces, check out these photos of front porches and screen porches, too. 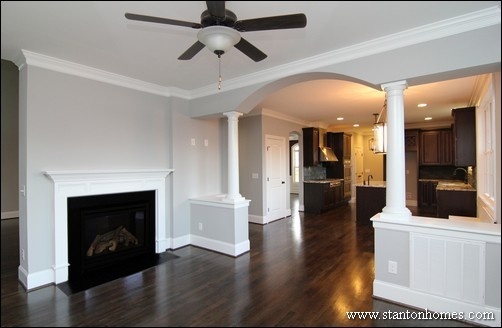 Contact Stanton Homes - tell us your entertainment space priorities, and we'll show you how much you can build, within your new home budget.